Happy Easter (maybe a day late) . . . holidays are different when you don't have kids in the house. There was no dying of the hard boiled eggs, no buying of the Easter candy, no attempting to make everyone happy with the Easter dinner but pleasing no one. Actually, it was kind of like any other Sunday for us, except that we celebrated with an all day Law and Order: UK marathon. By the end, I actually did believe that Jamie Bamber was a Brit after all. Amazing. At least while I was off I got to knit on the February Lady Sweater, which I will now refer to by its new and improved name: Mabel. For some reason, I just don't want to call it by FLS possibly for fear of jinxing myself. So Mabel she is, and truly, I have no idea where the name came from . . . it just strikes me as a Mabel. I think I have about eight more inches of the body to go and then just the sleeves. It's coming along quite nicely, and the rhythm of the Gull Stitch comes back relatively quickly. Probably helps that I have a student teacher right now (and that I have a ton of television series on DVD to watch). I'm hoping . . . hoping . . . that it will be done by the end of April. The shop is having a WIP-a-thon, but I'm not sure that I'm going to participate. Trust me, it's not that I don't have any WIPs (au contraire) but I really want to concentrate on getting a sweater done for a fall class . . . and I know my limits. The sock I finished was started when I got my sweet peas tattooed this summer. 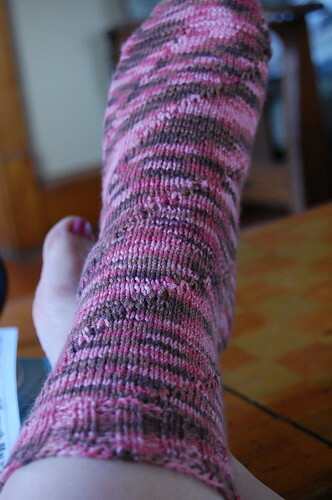 It languished, as socks so often do, and needed only a few more round until it was finished. When I started this pair, I know that I intended to knit the left one spiraling one way and the right one spiraling the opposite. I think that if I reverse the position of the decrease and the way that I knit the decrease I should get the desired effect . . . but will I? 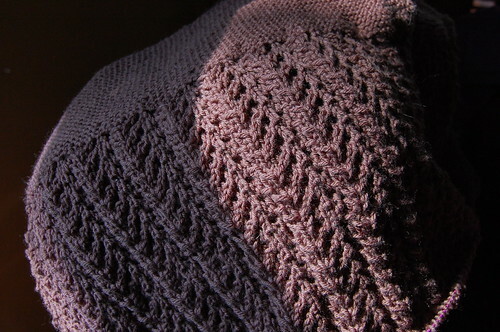 For this one, I knit until the decrease, did a yarn over, and then knit two together. So, if I knit until the decrease, knit two together through the back loops (because I am lazy . . . sue me), and then the yarn over, I am thinking it will work. Famous last words? Enjoy this beautiful weather . . . our state standardized tests begin this week . . . joy. PS - The girls will be 19 in ten days . . . huh. We'll be celebrating a week early next weekend in Philly with a big dinner . . . which should be fun. I'm dying (no pun) to know what yarn you used for your sock. I love the patterning. I used Crystal Palace's Panda Superwash in Rose Musk. It's a combination of bamboo, wool, and nylon ... the patterning is purely on accident. I've got to say I love the hand of this yarn ... it drapes beautifully.